Despite almost forty years having passed since the withdrawal of ground troops from the country and the subsequent political work aimed at healing the hearts and minds of the public, the trauma of the Vietnam War still weighs heavily upon the American unconscious. Re-enacted through numerous cultural texts (films, television and literature) that followed in the wake of the war and casting a shadow over the recent conflicts in Iraq and Afghanistan, ‘Vietnam’ remains a persistent site of cultural negotiation. “[T]his book has two goals: a historiographic one that attempts to write a new history of the visual mass media of the Vietnam era that accounts for the visibility of Asian and Asian American bodies in these cultural texts, and also a theoretical one that draws upon psychoanalysis and film theory to provide new models for thinking about the relationship of cultural texts to racial and national politics” (9). The psychoanalytic framework of Chong’s analysis offers a productive approach to race in the context of representation. Drawing on the work of Jean Laplanche and the notion of the ‘racial phantasmatic’ Chong defines the ‘oriental obscene’ as “a set of fantasies that reveal the relation between suffering and violation, activity and passivity, and victimhood and victory in the politics of the Vietnam War” (10). Providing a means of analysis beyond the referential ‘realities’ of the Vietnam conflict, the phantasmatic element of Chong’s ‘oriental obscene’ enables an clearer articulation of the way racial categories are subject to shifting identificatory positions through processes of projection, transference and condensation. However, this publication also retains traces of an earlier definition of the ‘oriental obscene’ that in an essay on The Deer Hunter (US 1978) Chong likened to a “phenomenon of mimetic contagion in which violence circulates from Asian to non-Asian bodies in American popular culture” (2005, 90). This idea of ‘mimetic contagion’ is evident in an early chapter in which Chong scrutinises the collapse of racial and political boundaries found in the American counter-cultural movements of the late 1960s. Building on Freud’s ‘primal scene’ not “as a record of a real event but rather the way it theorizes the act of witnessing and a subject’s relationship to his or her own history”, Chong situates 1968 as a “phantasmatic point of rupture between an America that used to be, before the Vietnam War, and the America that it will become after this violent encounter with the oriental obscene” (37). The Oriental Obscene also makes effective associations between the various ‘indexical’ texts selected for analysis. For instance, in her assessment of The Deer Hunter, Chong returns to the image of Saigon Execution in order to elucidate the way the Russian roulette scenes enact “not the mastery of the American viewer over this historical trauma, but rather the subjection of the American nation to the re-enactment of its original scene of defeat” (135). Through these types of comparisons, Chong illuminates the relationship between contrasting representations of the war while evaluating their evolving response to issues of race. Arguably, the most significant contribution made by The Oriental Obscene occurs in the latter chapters in which Chong turns from those manifest representations of the war to a study of the ‘kung fu craze’ that occurred in America during the 1970s. Examining overseas productions such as Deep Thrust (HK 1972) and The Street Fighter (JP 1974) together with the Billy Jack films (US 1967-77) and the Kung Fu television series (US 1972-75), Chong presents a convincing case for the significance/popularity of these representations in the context of America’s post-war trauma. “Through Asian martial arts the American national subject comes to understand the violence that plagued it throughout the Vietnam War and also adopts a project to internalise and redirect that violence into a form of self-mastery” (177). The one key exception to the processes of projection and transference between Asian and non-Asian bodies offered by these types of texts, Chong suggests, are those films starring Bruce Lee. Returning to the Deleuzian concept of the movement-image, and highlighting the meta-textual spectre of Lee’s death (which shadows his filmic presence), Chong argues that, “Lee disrupts [the kung fu genre’s] narratives of mastery and signals the limits of the ability of martial arts to respond to the mass death and suffering of the Vietnam War” (211). The Oriental Obscene concludes with a discussion of the Missing in Action (US 1985-88) and Rambo (US 1982-88) films whose stars (Chuck Norris and Sylvester Stallone) represent, “a different orientalised body, one neither fully traumatised nor invincible, but rather a condensation of both fantasies simultaneously, resulting in an ostensibly white body whose origins are thoroughly oriental” (251). For Chong, such figures not only reaffirm the influence of the oriental obscene in constructing images of hegemonic white masculinity but reveal “how easily the earlier fantasies and identifications can be repressed by the emergence of a new racial phantasmatic, a new historical periodization” (281). Taken in the context of scholarly investigations into representations of the Vietnam War, Chong’s work is a thoughtful and important contribution to the canon. 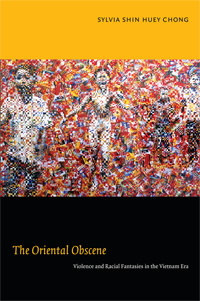 However, as an exploration of otherness and the construction of racial identities, The Oriental Obscene also provides a valuable resource to broader areas of research in film and media theory, cultural studies and other critical approaches to race.